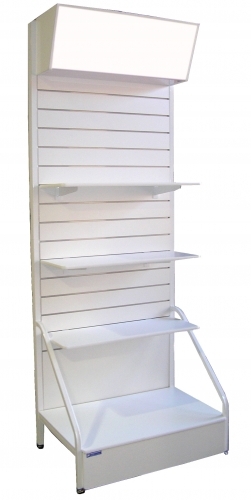 Our modular wall shelving unit is a practical, flexible, economical and non-permanent solution for businesses needing to display their products on shelving or via a hanging solution. 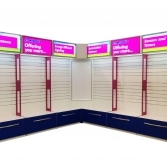 Using versatile slatwall (also known as slatboard), Displayrite Resources ready made units are mobile, sturdy, strong, versatile, available as flat pack or installed, and are available with a range of accessories to suit almost any product display requirement. 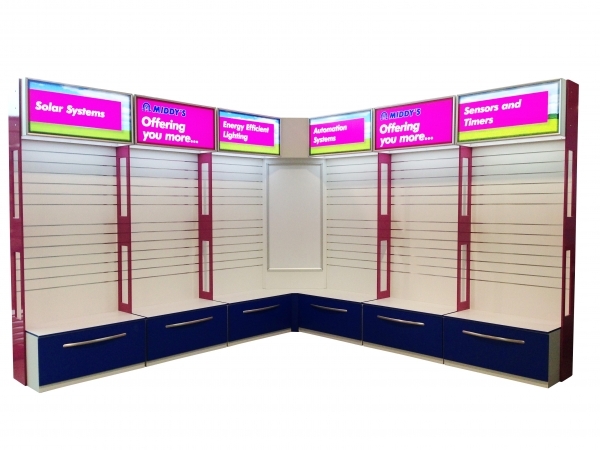 Don’t leave your products and brand in the dark; ensure they stand out from the competition and to the consumer with a lightbox at the top of the stand, highlighting product, as well as your brand or company logo. These can be supplied as a simple plug & play version, utilising existing standard power points. LED lighting means lower power consumption costs and you will never need to change a globe. Made in Nunawading in the east of Melbourne, we can distribute locally or around the country either in flat pack, pre-assembled, or as a complete installation. 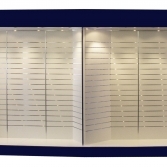 We can also supply, or supply and fit slatwall into your retail or trade showroom in a range of different colours and designs using our in-house joinery for a complete solution. 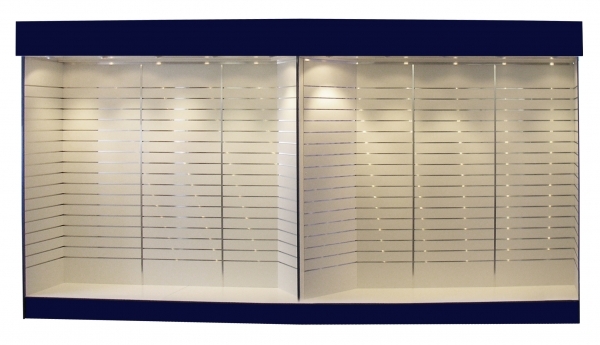 Background prints, audio/visual inclusions, and information panels are great ways of differentiating your products and stores, leaving a positive and lasting impression on consumer’s. 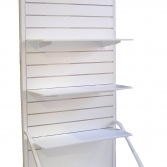 See our gondolas & freestanding shelving units page to see our range of related units that are ideal for mid-floor displays, under windows and other non-standard situations.